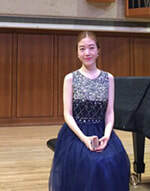 Pianist Jae Eun Baek, is originally from Seoul, South Korea where she grew up and began studying music. Having been born into a family of musicians, and with a composer as a mother, Jae Eun was exposed to music from a very young age. As a teenager she was trained in an arts school which specialized in an art educational system for gifted young students.She received a Bachelor of Music from Yonsei University, in Seoul, South Korea. After finishing college, she moved to the United States and studied for her Masters degree at Indiana University, Bloomington with Prof. Edward Auer. She is the recipient of the 2016-2019 Butler School of Music Scholarship and the 2016-2019 COFA Scholarship, which is awarded by UT Austin, College of Fine Arts. Starting in 2016, she became a member of the MTNA, and she participated in the 2017 MTNA collegiate chapter which was hosted at the University of Florida. Currently, she is pursuing a Doctorate Degree with Prof. Andrew Brownell at The University of Texas, Austin. ​She has taught students at various levels privately in Korea, and also studied piano pedagogy with Prof. Taylor at Indiana University. As a pianist she is passionate about performance and teaching, and she especially loves to teach young children.